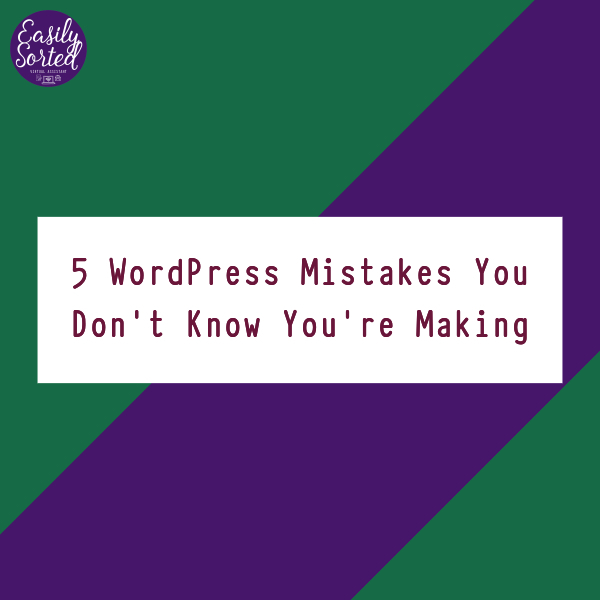 It’s easy to make WordPress mistakes. After all, WordPress prides itself on being easy to set up and use – even for beginners. That’s how it’s become the most common website platform out there. But as often happens with something that’s easy to use, you tend to pay attention to just the visible parts, and not the stuff underneath. You might not be a techy person – and that’s ok. But if you’re not up to dealing with these things yourself, you really need to have someone to do it for you. Not using a child theme. So you’ve got this theme that makes your website look AWESOME. And then you update the theme, and – what the heck happened to that pretty layout?! Most likely, all the pretty formatting was in the theme files instead of a child theme. When you update the main theme (called the ‘parent’ theme), it overwrites all the files, so if you’ve made any changes, those will be lost. What the child theme does is use most of the formatting from the parent. But if the child theme has another setting, it overrides the parent and uses those settings instead. It means that when the main theme is updated, the child theme stays the same, and your website looks as if nothing happened! You can easily set up a child theme based on your main theme with a plugin called Child Theme Configurator. Not updating plugins, theme, WordPress version. People! You cannot just ‘set and forget’ your websites! Plugins, themes, and especially your WordPress version need updating from time to time. Developers bring out new versions to fix bugs, add new features, and close security holes. Conveniently, most WordPress core updates are done automatically these days, but you’ll still need to login and update everything else now and then. Keeping unused plugins & themes installed. Did you know that inactive plugins & themes are some of the main things that website hackers look for when targeting a website? If you’ve installed plugins and aren’t using them anymore, deactivate and delete them. Not only is it another obstacle for hackers, but it’ll also give you more space on your hosting account for the stuff that matters. Using the default ‘admin’ user. Whoever installed your website – you, your website developer, your nephew with some IT skills – should have changed the default username from ‘admin’ to something else when they set it up. If they didn’t, guess what – that’s the first thing hackers will try when they target your website. If you still have a default user called ‘admin’, you can’t change the name through the WordPress dashboard. But you CAN create a new admin user with a different username. Make sure you remember or write down the password. Then, delete the default ‘admin’ user. BEWARE! You should ONLY delete the default ‘admin’ user after you have successfully logged in with the new username. Looking for detailed instructions on how to remove the admin user? Not making backups. I CANNOT STRESS THIS ENOUGH. You should be backing up your site regularly – at least as often as you add new content. Don’t assume that your web host is making backups for you. Even if they are, you can never have too many backups. Go and grab Updraft Plus for a nice, simple backup plugin (free and pro versions available). BackupBuddy is another popular one. Which of these WordPress mistakes have you been making?